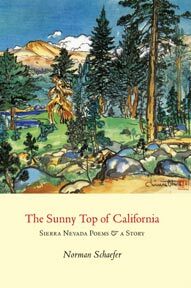 Norman Schaefer’s The Sunny Top of California: Sierra Nevada Poems & A Story (La Alameda Press, Albuquerque, 2010). It’s beautifully designed by master bookmaker JB Bryan, has an Obata woodblock on the cover and lively poems (and a story) that will charm lovers of mountains and verse in the same way that Chinese poets memorialized the mountains of their land. my mind opens and clears. Norman Schaefer lives in Port Townsend, Washington.